Reading Myrtle Heery’s (2014) edited anthology Unearthing the Moment: Mindful Applications of Existential-Humanistic and Transpersonal Psychotherapy reminded me why I love and am so passionately committed to these fields of study and practice. Heery and 24 other contributing authors offer penetrating insights into core aspects of existential-humanistic and transpersonal psychotherapy, within an impressively diverse range of specific applications and clinical settings. Topics include therapist self-care, community mental health, transitional care with those experiencing homelessness, weight management, sports injury, childrearing, surfing, cross-cultural travel, disaster relief work, the shamanic journey, dream work, art therapy, therapeutic use of poetry, and bereavement-related caregiving. The result is a virtual tour-de-force of dynamic existential-humanistic and transpersonal scholarship born out of profoundly transformative experiences within a training program that Heery and her mentor, James F. T. Bugental, developed, the foundation of which rests on the latter’s professional work as a pioneer in the field of existential-humanistic psychotherapy. 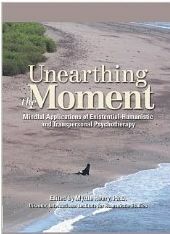 Recognizing that, to a significant extent, the fields of existential-humanistic and transpersonal psychotherapy still lie outside the domain of “mainstream” therapeutic approaches, the perspectives of these authors demonstrate the vital need for these fields to continue fulfilling their inherent purpose as “prophetic correctives,” affirming subjective human experience as the heart of the therapeutic endeavor. The great value of this work is precisely in its central and intensive emphasis on unearthing or directly accessing the present, moment-by-moment experience of living human beings, particularly within the context of the therapeutic relationship. This is clearly evident in the shared, integral concern of all contributing authors with the foundational construct of presence. Each author articulates his or her own unique understanding of the nature and role of presence within the relationship between therapist and client, yet they are in impassioned agreement regarding its absolute necessity to personally meaningful and truly life-changing psychotherapy. This is a vital plea for therapy as an essentially human and subjectively experiential encounter that the broader culture of our contemporary mental health system desperately needs to heed and acknowledge. Several authors poignantly describe their very personal frustrations, fears, and despair related to clinical practice within managed care treatment settings, and the tremendous difficulties that they have faced as practitioners who strongly value the present moment encounter in the therapeutic relationship and yet are forced by professional and practical necessity to comply with objectively prescribed treatment guidelines and procedures. A fundamental strength of this book is the courageous commitment of the authors to communicate authentically and transparently their personal, subjective experience of the therapeutic relationship and process. While they are indeed speaking as professional clinicians, they genuinely share and reveal themselves as real people, living human beings with their own struggles and transformational experiences. There is no sign of the all too typical objective detachment, “professional judgment,” and technical, diagnostic jargon. Rather than retreat and hide behind their professional personas, they maintain an admirable and inspiring dedication to communicate directly their real, human concerns, thoughts, feelings, hopes, and value perspectives. Their enlivening stories concerning the therapist’s personal journey within clinical work reminds us of something fundamental and inescapable that all therapists know but too many still try to forget and suppress, namely, that underneath the projected “professional” image, the practitioner remains a human person who in reality is quite similar to the client. We are challenged and encouraged to unearth our real, human selves, relinquish our compulsive hold on the absurd façade, and (within appropriate boundaries of course) simply BE REAL. There is also a recurrent and focused utilization of intentionality as a grounding construct throughout the book. While it is implicitly visible in every author’s contribution, many of them address it explicitly and with serious attention in their chapters. One is struck by the underlying power of their declarations affirming intentionality as essential to the therapeutic process, although not exactly in the way that might be expected. Yes, the authors discuss the foundational importance of enhancing the client’s intentionality, which is a basic, core tenet within the existential-humanistic framework, but they go further in terms of urging the intentionality of the therapist as well as illuminating the mutual intentionality between therapist and client. In so doing, readers are confronted with a welcome but inconvenient recognition of the therapeutic process as a living interactional field between beings who are actively choosing how to live and exist within the present moment. The therapist serves as an authentic human model for unearthing the latent possibilities and potentialities within the present moment and making them actual. As Heery (2014) aptly states, “The healing process involves mutual activation of intentionality for both healer and healed, therapist and client” (p. 256). Another central and recurring aspect of the authors’ work concerns the relationship between individuals’ inner subjective experience and the objective world around them, which in effect offers a powerfully compelling argument against our mental health system’s misguided obsession with supposedly “objective” treatment procedures such as evidence-based practice. The authors suggest and strongly maintain that a mindful awareness of one’s subjective experience within the present moment is in fact the ground from which healthy changes emerge in the objective world of one’s life. Changes within inner subjective experience result in changes within objective actions throughout a person’s life and the world surrounding him or her. Subjective reality transforms objective reality, and indeed, how could it be otherwise? The unmistakable and vital implication is that eliminating the subjective domain while exclusively favoring the objective domain within psychotherapy simply negates the latter; objective changes occur on the basis of subjective transformations. Our souls are calling us toward and into psycho-spiritual transformation, and we must choose whether we will answer that call—ultimately, the one call that matters most above all others. Undoubtedly, voices from the predominant mainstream in the mental health field will deride, mock, and dismiss such a perspective and its corresponding language. However, the vision of these authors is precisely what our field and global culture most desperately need and secretly long for; as human beings, we most deeply yearn for such transformational healing, not merely the alleviation of symptoms or the elimination of objective behaviors. We want the meaning and experiential quality of our lives to be saved—that is, enhanced, strengthened, and fulfilled—and this can only be accomplished through the transformation of our subjective awareness in the present moment. I want to save my life and so I will answer the soul’s call. If you also wish to do so, I urge you to read this book!